Three people in a group from Hong Kong were seriously hurt and one slightly injured in the attack in Wuerzburg. Another 14 were treated for shock. 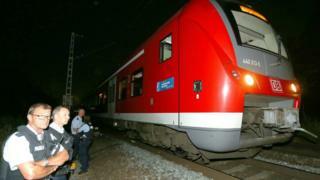 One local man told DPA news agency that the train carriage where the attack took place "looked like a slaughterhouse". Hong Kong Chief Executive Leung Chun-ying has condemned the attack. Immigration officials from the city will accompany family members to Germany. Although the motive has not been established, the BBC's Damien McGuinness in Berlin says there is nervousness in Germany about attacks by Islamist extremists following the attacks across the border in France. In May, a man reportedly shouting "Allahu akbar" killed a man and wounded three others in a knife attack at a railway station near the German city of Munich. Were you on the train? Have you been affected by the incident? Tell us your experiences by emailing haveyoursay@bbc.co.uk.